After serving for 15 years with the Reserves (Territorial Army) I saw it go from a big boys drinking club into a professional outfit capable of supporting its regular counterparts on operations. Over the last 10 years the Reserves have provided 1000’s of troops to the operations in Iraq and Afganistan. The officers and soldiers of the Reserves have stood along side their regular counterparts despite having day jobs, limited experience and limited training. What struck me as we saw the death toll rise in Afganistan is the lack of differentiation between a Regular death and a Reserve death, some would say this is the One Army concept working but I think this hides the contribution the Reserves are making. The real trigger for this was the loss of a colleague Pte Joe Whittaker in 2008, if you look at the Play section on this site and the “40 miles with 40lbs” photo you will see Joe & I stood at the back. I spent 6-months training with Joe for the competition so got to know him well. 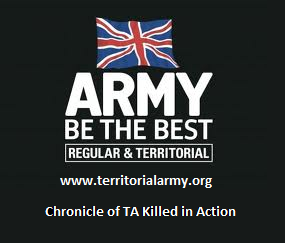 So I created this blog to chronicle the TA’s contribution in lives to Army operations.